Amkor’s FusionQuad® (VQFP/HVF-PQFP) technology represents a breakthrough in leadframe-based plastic packaging through the effective integration of ExposedPad Thin Quad Flat Package (TQFP) and MicroLeadFrame® (MLF) technologies. FusionQuad technology extends the I/O range of classic leadframe packaging to nearly 400 unique pins and delivers an approximate 50% reduction in package size for a given lead count. Additionally, these packages provide excellent RF electrical performance characteristics with short signal paths to the bottomlands and high-power dissipation capability with the solderable exposed die attach paddle. The novel integration of bottom lands in a Quad Flat Package (QFP) provides a cost-effective platform for an increased lead count in a small form factor. 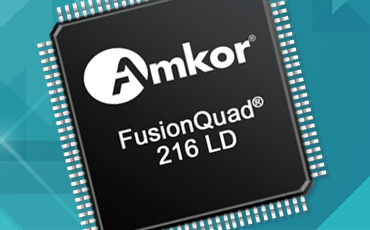 Amkor’s FusionQuad provides an ideal package format for most IC semiconductor technologies including advanced mixed-signal SoCs, MCUs, ASICs, DSPs and a variety of others. These packages are particularly well suited for applications requiring superior electrical or thermal performance in a cost-constrained environment including storage, computing, communications, automotive and many others.